The New England Patriots’ only loss of the season came against the Buffalo Bills, the team they will be playing this weekend, which means the Patriots will have revenge on their minds this week. 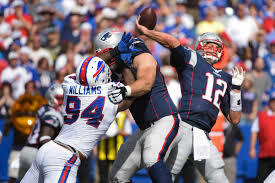 After Buffalo’s win against the Patriots, Bills head coach Rex Ryan admitted the win came with an asterisk because Tom Brady, who was serving the final game of his four-game suspension, did not play. With Brady back in the lineup, the Patriots have favorable NFL Lines to win the game. Brady has been back in the lineup for the Patriots for their last three games, which have all been wins. The future Hall of Famer also has the offense playing at a higher level, outscoring their opponents 95-46 in those games. Even though they have used three different quarterbacks this season, the Patriots are the only team that hasn’t thrown an interception this season, sporting a league best passer rating of 115.9. The Patriots defense has also played very well despite dealing with injuries and suspensions, and are as healthy as they have been all season heading into their rematch with the Bills. Defensive end Rob Ninkovich, who missed the game while serving a suspension, will be back in the lineup, which will give the defense a big boost after they were shredded by Tyrod Taylor in the first game. If the Patriots win, Bill Belichick will need to admit that their win should have an asterisk because the Bills are expected to be without leading rusher LeSean McCoy and receiver Sammy Watkins, who are dealing with injuries. With McCoy and Watkins not expected to play, the Bills will be relying on Taylor to get the offense going with his arm and feet. In the first meeting, Taylor finished with 246 yards passing and one touchdown, but he made a lot of plays with his feet to keep drives going. The Patriots will be trying to limit Taylor’s big play ability on the ground and force the young quarterback to beat them with his arm. They are hoping Ninkovich will help them keep Taylor in the pocket and limit his big play ability. While the Patriots have been playing well and have enjoyed some success since Brady returned, the team has an unexpected special teams problem right now with Stephen Gostkowski, who has been one of the best kickers in the league for some time now, not being very reliable this year. Going into the season, Gostkowski had not missed an extra point since his rookie season, even last season when the spot of the ball on extra point s was moved back. However, Gostkowski has missed two extra points this season and has made only 9 of his 12 field goal attempts this year, which is the lowest field goal percentage of his career. As expected, Gostkowski isn’t happy about his recent kicking issues, but Bill Belichick praised his kicker’s work ethic and said they would work through it. Belichick also dismissed the theory that Gostkowsi’s woes were caused by the different techniques that he has been asked to use on kickoff this year. Matt Slater, the Patriots special teams’ captain, added that the team was fully behind the struggling kicker.